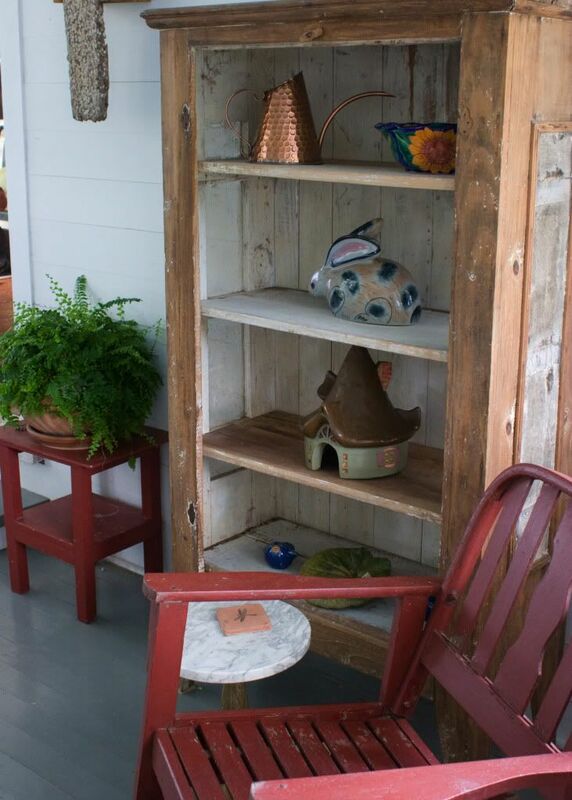 This weekend we started redecorating our screen porch, attempting to turn it into a cozy open-air living room. We took everything out and washed the walls and the floor with buckets of warm soapy water. Then we drove up to Thomasville in search of some sort of primitive cabinet to serve as a focal point and bring some height to the room. The trip to Thomasville was really fun because we got to have Mexican food and French fries while we were there, and we spent a long time poking around in Relic's, which is like some crazy old lady’s huge, dusty attic. Relic's really had some cool, creepy things. There were old chicken cages and garden statues, scary Victorian portraits, chandeliers, and seed cabinets. We ended up buying an old door-less pie safe for our screen porch. We had brought the wrong car for hauling it home, however. Rob asked the owner if we could come back and pick up the pie safe the next weekend. “We’d prefer you didn’t,” the lady said. “Ha! I drive farther than that to go out to dinner,” the lady countered. “But it’s an hour home, then an hour back, then an hour home again,” Rob said. I was laughing. She was really sticking it to Rob. We had fun setting up our pie safe. I dug around in the closets and filled its shelves with rustic treasures—an old Herty turpentine cup, for instance, and a copper watering can. The cats were really excited; they love new furniture. There was soon a cat relaxing on each of the four shelves. We bought some puffy, comfortable chairs and a loveseat at Lowe’s. We got all that set up on Sunday. Then I potted a new fern and filled some vases with non-toxic bouquets (the cats are always curious about bouquets, so I went with edible mint sprigs). We’re not done yet, but the porch is really coming together. It looks so cute and cozy at night with the lamp lighted and a bunch of cats sleeping on the soft chairs. It kind of reminds me of the Swiss Family Robinson tree house. I want to invite you guys over--but this time I will clean better before you come so your feet are not coated in cat litter!